← 74. Fairmont Kittocks. 20 Dec 2017. A must visit course for US Historians, fish lovers and record book chasers! Arbroath is the largest town in Angus and it’s golf course sits about 2 miles to the east of the town and only 6 miles from Carnoustie. It probably gets bypassed by many visiting golfers moving north from Carnoustie towards the wonderful links courses in Aberdeenshire – this would be a wasted opportunity. Arbroath has a remarkable claim for it’s influence on the modern world. The “Declaration of Arbroath”, a Scottish declaration of independence of 1320, is regarded by several historians as the model for the American Declaration of Independence. The golf course can also argue a potentially unrivaled and rich architectural history. 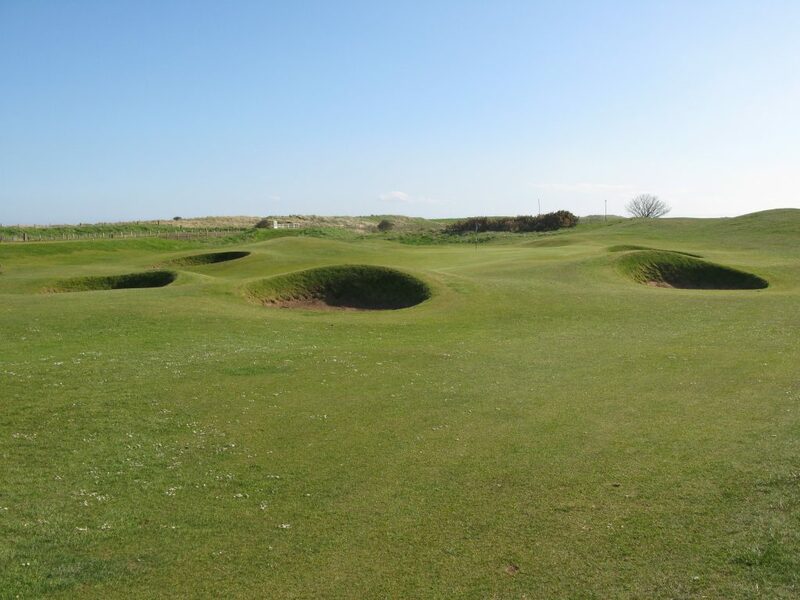 Designed by Old Tom Morris, it opened in 1878, was redesigned by the Troon professional Willie Fernie about 30 years later, then James Braid remodeled the tees, to add length, and bunkers in 1931. That’s a strong golfing pedigree. The course is predominantly an out and back layout. 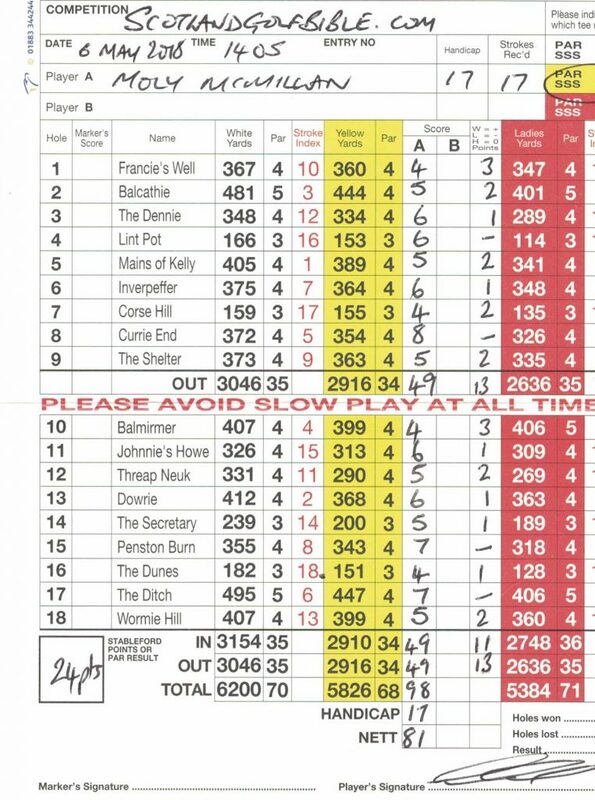 The first 7 holes are played westward into the, normally very strong and cold, prevailing wind, before turning back for the 8th to 10th; westward again for the 11th and 12th, then with 5 of the last 6 holes played eastward downwind back to the clubhouse. Strategically, 11 of the holes have reachable out of bounds to the right, so right handed slicers may wish to consider their options off the tee. 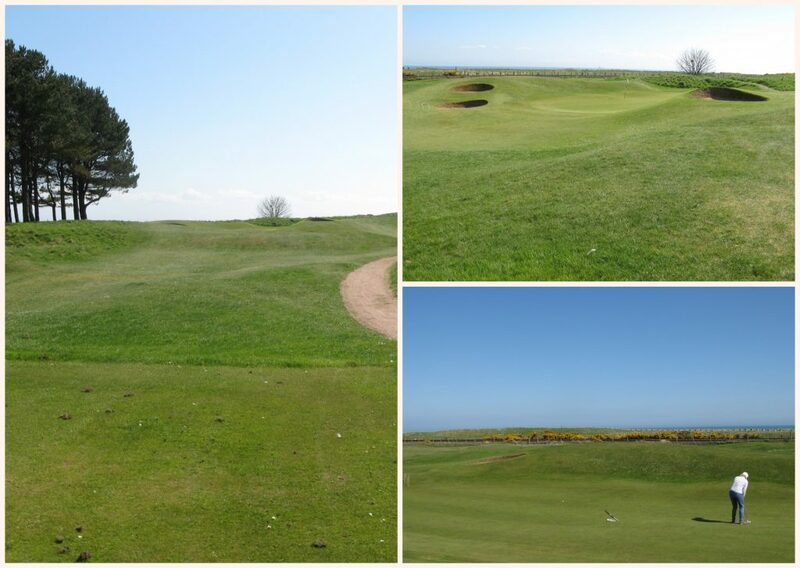 The Stroke Index 7, 375 yard 6th hole at Arbroath, a typically difficult par 4 on the opening stretch of holes. 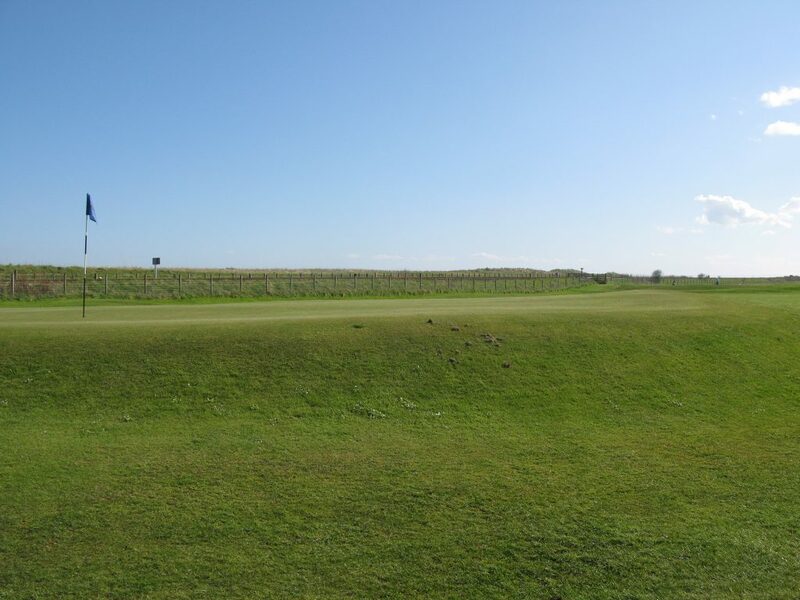 Viewed from the tees, Arbroath seems at times flat and innocuous, but it has been very cleverly bunkered by Braid, and I’m sure the locals will have many advisory comments on where to miss the greens. The greens were also very hard when I played and difficult to hold (for all I guess other than very good golfers). Playing off the yellow tees didn’t give much respite either, as the 2nd and 17th both played as long par 4s, rather than par 5s from the white tees. There are also 3 ditches that cross the course, and these need to be carefully considered, especially as the flat terrain makes them invisible to the eye. I rather suspect first time visitors rarely score much above 30 stableford points. The highlights for me were the par 3s, all of which had good surrounds, with the two on the back 9, the 14th at 200 yards (white at 232) and the 16th, being especially difficult. It’s a well kept course, with good tees, greens, fairways and bunkers. The clubhouse has a friendly staff and good food, where you can try the Arbroath Smokie, the local smoked haddock delicacy protected by EU Trade regulations. The other Arbroath claim to fame is the local Football Club, which holds 2 world records – the highest professional scoring record (winning 36-0), and their ground, Gayfield Park, being the closest to the sea in the world – only 5 and 1/2 yards away! Apparently, one famous game was abandoned after all balls were “lost at sea!”. Not a great day for me, I lost 3 balls (6 shots) and 3 putted 7 times! I suppose that explains completely my 13 over par net! Oh, and yes, the greens are rather large and difficult! 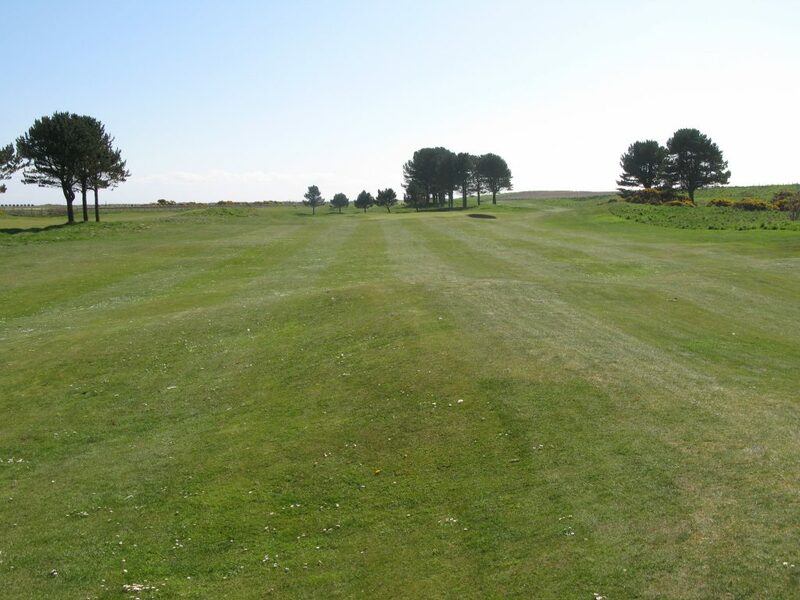 This entry was posted in 18 holes, 1851 - 1900, 4 star, 4.5 star, Course Architech, Course Owned By, Course Quality, Course Type, Dundee & Angus, Holes, James Braid, Links, Local Authority, Old Tom Morris, Overall Value, Price, Region, When Course Established, Willie Fernie, £40 - £59. Bookmark the permalink.